16th match of ICC Worldcup 2015 has been played between Ireland and United Arab Emirates at Brisbane Cricket Ground today. UAE put good score of 278 runs with helps of Shaiman Anwar's century knock 106 runs. 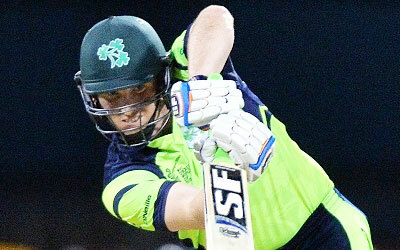 Ireland chased 279 runs successfully with GC Wilson's 80 and KJ O'Brien's quick 50 of 25 balls in 49.2 overs. Earlier, Ireland won the toss and put UAE into bat first. UAE started inning with Amjad Ali and v confidently. Both played slow and stedy cricket and added 49 runs before AR Berenger lost his wicket scoring 13 runs. Krishna Chandran joined with Amjad Ali but gone for a duck. Khurram Khan came in middle and played good inning of 36 runs. Amjad Ali also contributed well 45 runs before lost his wicket. Shaiman Anwar played good inning of 106 runs and put UAE on front foot. At the end of 50 overs UAE made 278 runs with 9 wickets. Following target of 279 runs, Ireland could not made batter start and lost PR Stirling early scoring 3 runs. EC Joyce joined with skipper WTS Porterfield and played good cricket initially. He made 37 runs before lost his wicket. WTS Porterfield also contributed 37 runs. Lower order batsmen GC Wilson and KJ O'Brien took the charge in hand and played superb innings for Ireland. GC Wilson played splendid inning of 80 runs wiith 9 fours. KJ O'Brien's quick inning of 50 runs in 25 balls put Ireland on front foot. Rest was done by tail enders and Ireland won the match by 2 wickets with 4 balls remaining.